AFF offers a wide variety of cleaner balls to fit any sifting application. Sifter balls and cubes work inside screen decks to prevent the screens from clogging with product or “blinding.” Screen blinding prohibits the product from flowing freely through the screen and leads to a loss in sifter capacity along with an increase in sifter tailings or overs. The most abrasion resistant and longest lasting ball on the market. Extremely oil, moisture, and chemical resistant. FDA approved. Available from 5/8” to 2”. They come in vibrant color options, non–magnetic, and with a T430 magnetic stainless steel core. AFF has answered our customer’s demands for a polyurethane ball that will not pass through magnetic separators or metal detectors. The magnetic stainless steel core provides assurance that any screen failure will be caught and remedied before product ever leaves the plant. 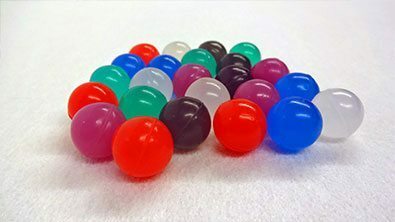 Many other “metal detectable” balls on the market do not have enough mass to effectively set off a metal detector once they have been worn down. AFF’s metal detectable balls will work every time because the mass of the stainless steel core never changes. Couple the stainless steel core with the abrasion resistance of polyurethane and you have the longest lasting metal detectable ball on the market! The most abrasion resistant and longest lasting pan cleaner on the market. Extremely oil, moisture, and chemical resistant. FDA approved. 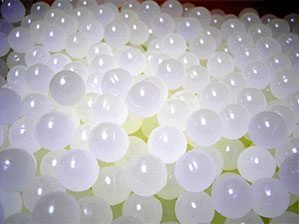 AFF stocks (3) types of rubber balls available from 5/8” to 2”. White Neoprene Rubber – Food grade neoprene rubber is resistant to fats, oils, ozone, and weather. Black Neoprene – For non-food grade applications. Black EPDM – Great abrasion, weather, and ozone resistance. Good for medium to high temperature ranges. 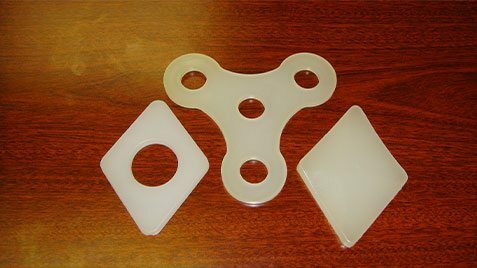 AFF offers food grade silicone which does well in applications with higher temperatures. The most abrasion resistant and longest lasting ball on the market. Extremely oil, moisture, and chemical resistant. FDA approved. Available in non–magnetic & with a T430 magnetic stainless steel core.